My childhood cat's box would never have found a place on a list of the best cat litter boxes. It was a beat-up old roasting pan tucked away in the dark basement right next to the furnace. No wonder she usually went outside when she needed a potty break! Things have changed a lot since then. But that doesn't mean they've gotten better for the cats. Most litter boxes seem to be designed with humans, not cats, in mind. 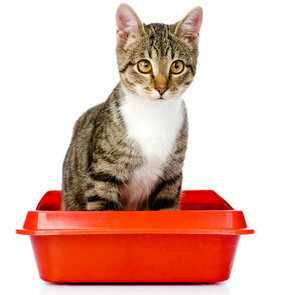 Next to food, the litter box is the most important purchase you'll make for your cat. Having looked at and scooped many boxes, these are the most cat-friendly I've found. They're my choices for the six best cat litter boxes and the ones I recommend. Clicking on the links will take you to Amazon. No, your eyes are not playing tricks on you! Under bed storage boxes make great litter boxes because they're big and roomy and have low sides. They're easy to scoop, too. We have five of them! This is the best cat litter box ever. It's designed for older or arthritic cats. But cats of any size or age will appreciate it because it's so easy to get in and out and so roomy. My cats love this box! Cats love this box because it's so roomy, and the entry is low and wide. For humans, the nonstick surface makes it easy to scoop, and the high sides contain scattered litter. If space is tight, this box is the perfect solution. It fits neatly into the corner of a bathroom or powder room but is as roomy inside as the regular Nature's Miracle box. It also has the same high sides to contain scattered litter. This box gets great reviews on Amazon because it's roomy and easy to scoop. Because it's stainless, not plastic, it doesn't absorb odors and won't develop cracks that could trap bacteria. If you must have a covered litter box (I wouldn't recommend it! ), choose this one. At least your cat will be able to see if another animal or human is approaching while she's in the box. Tip: The location of your cat's litter box is nearly as important as the box itself. Choose a location that's convenient and comfortable for your cat. Most cats find a laundry room or basement inconvenient! Would you like diving headfirst into an unflushed toilet? Your cat doesn't either! I pet sit for two families of cats who have these boxes, and I'm always surprised that they use them. There are other ways of containing scattered litter that make life a lot more pleasant for your cat. Just looking at this box makes me angry. It's too cramped, too dark and too smelly. And why would the designer think cats would want to walk up a "circular staircase" to get to their box? I pet sit for cats who have this box, and most opt for the floor instead.